It needs more for a good comic than just an interesting script with exciting and funny dialog. The art is equally important to visualize the story optimally for the reader. William Van Horn follows the tracks of his great model Carl Barks in the production of his Disney comics. Like the legendary duck man Van Horn avoids situations in his stories where the characters just stand around and talk. There is always something moving in Bill’s comics, even if it is only a mosquito flying by. Another important thing in Van Horn’s drawings are the facial expressions of his protagonists. Feelings like disappointment, arrogance, anger, joy or determination always reflect in the faces, making describing words unnecessary. As for Donald’s nephews, Bill avoids giving them the same postures and draws each with a different expression. The crucial thing for a comic series, however, is variety. Van Horn puts his favorite character, Donald, in new situations, changing not only the emotions, but also the place of action. Sometimes the Ducks act in house and garden, but often they move beyond the border of Duckburg to the great outdoors. Especially beautiful are the atmospheric drawings of mountains, woods, beaches, caves, waters and desert landscapes. So much diversification is still not enough – the seasons are an essential factor in Bill’s stories. It is no surprise that the Ducks have acted in exactly 15 winter tales until now. Sometimes the snow is just decoration. In some stories, however, the white splendor affects the plot, for example to make footprints visible. Van Horn’s snow flurries are especially beautiful, with thick and dense flakes falling from the sky. Bill’s winter tales have become a steady establishment since 1998. Each year the American does a new one. Production of the snow stories must be finished on time, however, so that Egmont can publish them in the winter months. For what is nicer than to sit beside a cosy fire and enjoy the full romance of the cold stories in the warm house? Sometimes it is also a pleasant thing to dig out one of Van Horn’s winter stories on a hot summer day and wistfully accompany the Ducks into the snowy winter landscape. The plots of these stories are always very adventurous. Winter walks, volcanic eruptions or toy thieves surprise us as well as a treasure hunt and other amazing situations. The Ducks even meet a fermi in the snow and in another story try to find a mysterious Sasquatch. Today the winter seasons will be getting shorter in several latitudes. Maybe the snow will disappear completely from these regions in some decades. William Van Horn will probably have retired then. His winter stories, however, bring the snow back to the many comic fans. 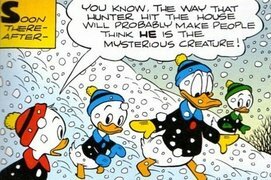 Even though the Ducks are snowed in in the mountain cabin, there is no snow falling from the sky in any panel. Donald and his nephews wear neither winter caps nor gloves. In this story Bill drew his famous snowflakes for the first time in a total of 20 panels. High on Kamikaze Ridge the Ducks wear winter caps and gloves. 3) D93050 Deck Us All! During the search for a Christmas tree on Old Saw-Tooth Mountain no new snow is falling. 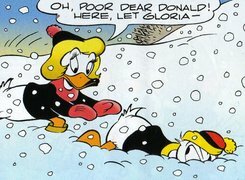 Donald and his nephews wear warm winter caps, but they do without gloves. Neighbor Jones does not need gloves, either. He wears a pompom hat, too. Woimly Filcher appears as a Christmas tree salesman. It does not seem to be very cold in Duckburg, for Donald and the boys do not need winter caps and gloves. In 28 panels snow is trickling down sparsely. This story mainly takes place in Donald’s house. Thick snowflakes are falling from the sky in 26 panels. Duckburg is drowning in snow. Huge snowflakes are falling to the ground in 82 panels. The Ducks wear winter caps and gloves. Gyro’s snow-melting ray gun causes a flood. The Ducks are dressed in warm clothes and search for the strange creature in winter caps and gloves. Thick snowflakes are falling down in 69 panels. On their search for the toy thief Donald and his nephews wear gloves and winter caps again. Thick snowflakes can be admired in 48 panels. Donald is equipped well for the winter walk with a winter cap and gloves. Woimly Filcher is dressed in warm clothes, too. Thick and dense snow is falling in 57 panels. It seems to be cold in Duckburg. Snowflakes are falling from the sky in 50 panels. Donald wears gloves, but he has left his winter cap at home. Daisy has attuned better to winter – in addition to a thick coat she wears a winter cap and gloves. In a dense snow flurry Donald’s nephews wear gloves and winter caps. Donald walks around without winter clothing. Very thick snowflakes are falling down in 58 panels. The Ducks are on the way near Scrooge’s mountain cabin in gloves and winter caps. However, no fresh snow is falling down and a volcanic eruption even causes the white splendor to melt. Donald and his nephews wear gloves and winter caps in the woods. 38 panels show us thick snowflakes. Donald chases the mysterious snowballer in gloves, but without a winter cap. Neighbor Jones wears a pompom hat and gloves. Gyro Gearloose has his gloves on, too. No fresh snow is falling from the sky this time. On the way to Dumb-Dumb Heights thick snowflakes are falling down in 58 panels. 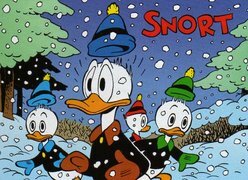 Donald and his nephews are dressed snugly in winter caps and gloves. Donald works on his sculptures in gloves and a winter cap. Thick snowflakes are coming down in 23 panels. There are some snowflakes visible in 20 panels of this story, but this is just a last feeble attempt of winter to prevent spring from coming. This story takes place in mid-summer. The Ducks travel to the Arctic, wearing their winter caps and gloves in the cold, of course. Fiddling around with her magic wand, Magica De Spell conjures up heavy snowfall even though it is not winter.